Game description: Mortal Kombat: Deception takes the series to the next level with multiple fatalities per character, interactive backgrounds, and new game modes. For the first time in the Mortal Kombat series, you can play a free-roaming Konquest mode, board games, and a puzzle game, in addition to the enhanced one-on-one fighting mode. 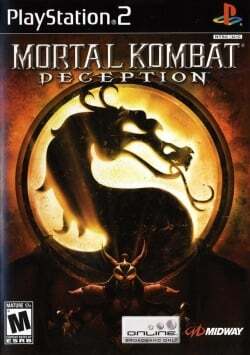 Mortal Kombat: Deception supports online play for both the PS2 and Xbox Live and features online matches and tournaments as well as online gameplay capabilities for both the board game and puzzle modes. Mortal Kombat: Deception follows Shujinko's quest to collecting artefacts called the Kamidogu for a mysterious god named Damashi. Shujinko must travel through 6 different realms, fighting new opponents along the way and learning new fighting styles. Runs above full speed., Right side of screen is distorted if gsdx is in hardware mode. Looks perfect in software mode. Game works fine (a lil slow) and stable., Right side of screen is distorted if gsdx scaling is used. This page was last edited on 26 December 2016, at 17:41.